Jeff has been granted and seeks special admittance to practice pro hoc vice in courts throughout the country and is able to meet clients promptly, wherever they live. If your child has been seriously injured, where can you turn for help? If your child is one of many victims of a dangerous consumer product, who can you trust to take on the powerful corporation at fault? If your family is suffering from a catastrophic or unexpected tragedy, who can you rely on to be at your side? 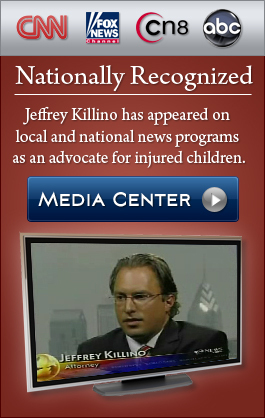 Jeffrey Killino is a nationally-recognized child injury attorney who represents injured children and their families in cases across the country. Jeff is known for his tenacity, dedication, and willingness to fight for injured children. In response to the safety hazard posed by lead-contaminated Mattel toys, he filed suit to force Mattel to help concerned parents test their children for lead exposure. Because of his efforts in another investigation, the National Highway Traffic Safety Administration issued a recall of nearly half a million dangerous tires on vehicles used to transport children. 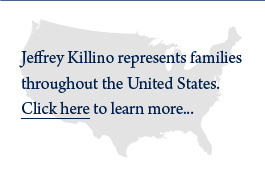 When a child’s safety is at stake, distance is not a factor for Jeff Killino, and he works to ensure that it is not a factor for you.Where you live and where your child’s injury occurred should never limit your choices in legal representation; your child should never have to settle for less than he or she deserves. Jeff will personally handle your case from beginning to end. Supported by a coast-to-coast network of experienced attorneys and experts in crucial child safety fields, he will be at your side through the entire process, whether doing so requires a short drive or a cross-country flight. As your advocate, Jeff will be accessible, prompt, meticulous, and caring. He will personally address your concerns, and never push your case off to a paralegal. If your child has been injured, contact Jeff Killino at 877-875-2927 for a free, straightforward consultation about protecting your child’s rights and interests. The Killino Firm also uses other offices of co-counsel when it obtains special admission.